We have discussed how one can disable OTP confirmations for IRCTC payments. In another move, SBI has started a new feature for their online banking users. They can enable Quick-Pay facility for IRCTC, and save time while booking journey tickets. In SBI online banking, this facility enables fast payment to IRCTC when you book your tickets. It will bypass any warning, confirmations and account chooser screen that are shown in other normal online transactions. So the payment will be deducted as soon as you login and instantly you will be redirected to IRCTC website without wasting a second. The quick redirection will be applicable on desktop browsers as well as on bookings through mobile app. Login to online banking portal. 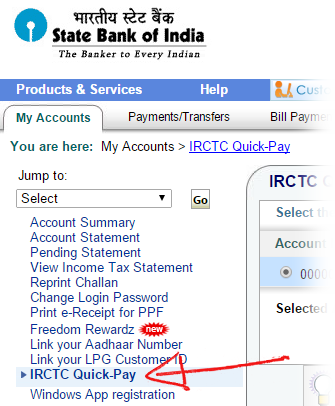 In My Accounts tab you will see a link for IRCTC Quick-Pay. Upon navigating, it will ask for Profile password. Put it there and submit. The next page would be a kind of disclaimer. Accept the terms and conditions and proceed. The next screen will show you all the accounts linked with your username. You have to choose one of them. The chosen one will be made default for all future payments to IRCTC. If you do not have sufficient fund at the time of transaction, it will simply fail and you can not choose any other account for payment at that moment. Once registered for this service, it cannot be canceled anymore. However you can change the default debit account at any point of time. After choosing the default account, a high security transaction password will be sent to your registered mobile phone. Upon verification, the service will be activated. You should see a similar screen as below. It cannot be disabled once activated. However the default account can be changed by following same process as above.